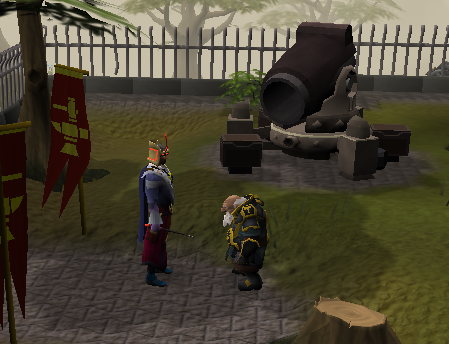 Speak to the Dwarf Commander Captain Lawgof, located Northwest of the Fishing Guild. To begin, speak with the Dwarf Commander, Captain Lawgof. 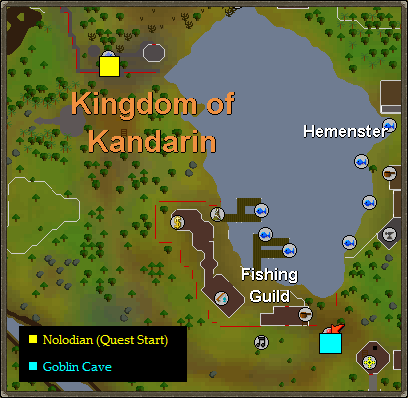 He is located northwest of the Fishing Guild, which is easily accessible with the Ardougne Teleport (if you have completed the Plague City Quest), or the Camelot Teleport if you have not. If you do not have the required magic level, you may buy a teleportation tablet to either location; however, the Ardougne Teleportation Tablets still require the completion of the quest to be used. The Dwarf Commander's responsibilities are to protect the mines from the ensuing attacks from the goblins. 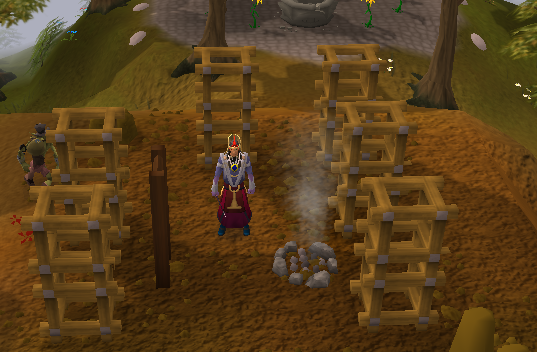 The goblins have recently broken-in and destroyed some of the railings on the fence surrounding. He asks if you'd like to join his army. If you agree, you begin the quest, and he will hand you 6 railings and a hammer. At this point, begin at one end of the Fences and slowly walk to the other end. 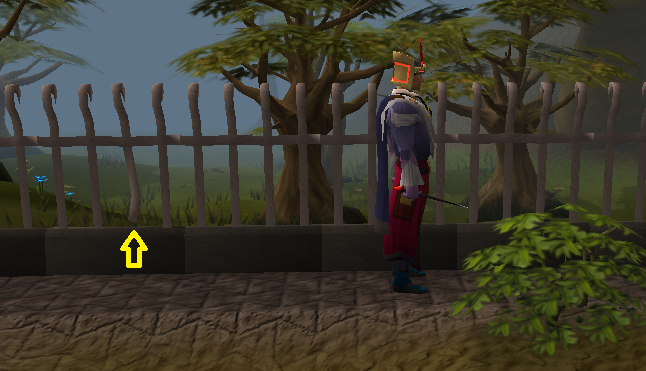 As you walk, look for bent railings in the fence (as shown below). When you find a bent railing, inspect it. It will tell you that the railing is damaged. When you press continue, your character will automatically attempt to fix the railing. You may receive a small amount of damage, and it may take a few attempts to fix. Once it is fixed, you will notice that there is one less railing in your inventory. Continue along the fence until all 6 railings are fixed. Return to Captain Lawgof when you have. The captain is overjoyed and claims that you've done the job and the goblins seem to have stopped coming in. He will begin to assign you another task. Upon agreeing to another task, Lawgof tells you that there are two men stationed in the tower to the South. The dwarf in charge is named Gilob, and you are to find him, as they should have reported in by now. Head through the gate. One click away on the minimap you will find the tower. Climb up into the tower. To reach the top you will need to climb two ladders. When you reach the top, you will immediately see Dwarf remains on the floor. Take them. Return to the captain with the remains. The captain asks you if you found any other remains. You assure him that you only found the one, so he says that the Goblins must have taken Lollk, his child, to their headquarters. You learn that the Goblin headquarters are somewhere from the Southeast. The Goblin headquarters are in the cave just east of the Fishing guild. Click here to navigate to the beginning of the guide and view the map, or scroll upwards. Enter the cave and head to the northwestern corner. Be aware that the goblins do attack you in this cave; however, they are only level 6 and are not any worry. The northeastern corner is full of crates. Move around the room, searching each of the crates. You eventually find Lollk in one of the crates. Talk to him. Lollk runs back to his father without you. Return to Captain Lawgof. He thanks you for the help, to which you say that you are always happy to help. Since this is the case, he asks you for one more favor. 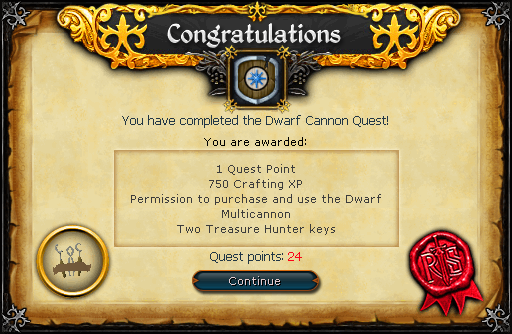 Once the last part is completed, he asks you to repair the Dwarf Multi-Cannon. The Captain hands you a toolkit. The Cannon is found right by the captain. 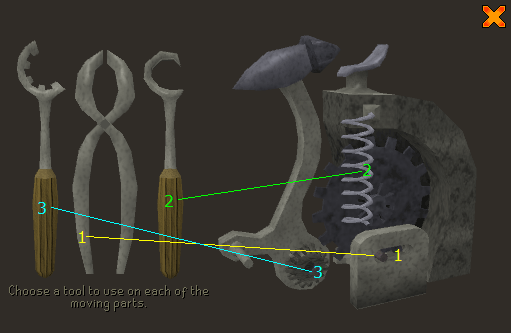 Use the toolkit with the cannon and a menu will be displayed, directing you to use different tools with the appropriate parts and gears on the right. You may have to experiment to discover the right order. Use the pliers on the switch, the hook on spring, and the wrench on the gear. You will receive a message saying the cannon is fixed, and the parts should be working together. If not, try again. Return to Lowgaf with the news. He is satisfied with your work, but asks you to go to the Black Guard base to find out what the Cannon Fires. 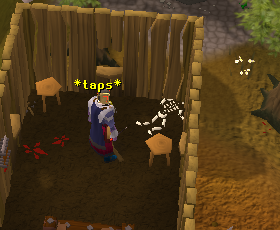 He tells you the base is located at the entrance to the Dwarven Mines which are north of Falador. You should speak to Nulodion. Nulodion gives you the ammo mould and instructions to it. He tells you to return them to Captain Lowgaf. Upon returning the mould and instructions, you will have completed Dwarf Cannon. Congratulations! [^] Talk to Captain Lawgof. [^] Agree to be recruited into Lawgof's army. [^] Look for broken railings, inspect them, and fix all six of them. [^] Talk to the captain. [^] Head to the tower south of the captain. [^] Pick up the Remains inside. [^] Return to the captain. 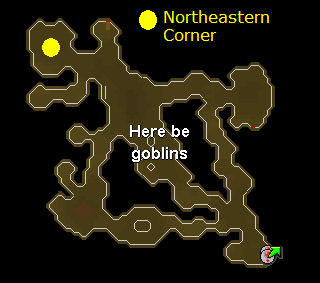 [^] Enter the goblin lair east of the Fishing Guild. [^] Search the crates in the Northeastern Corner until you find Lawgof's son. [^] Use the proper tool on each of the parts. 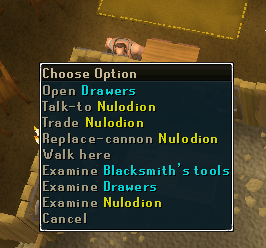 [^] Find Nulodion on Ice Mountain by the Dwarven Mines and talk to him.